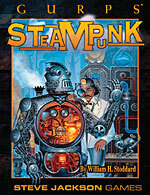 Bring your steam-powered games to GURPS Fourth Edition with GURPS Steampunk 1: Settings and Style, GURPS Steampunk 2: Steam and Shellfire, and GURPS Steampunk 3: Soldiers and Scientists. Get to your steampunk destinations in style with GURPS Vehicles: Steampunk Conveyances, an assortment of more than 30 different vehicles of varying realism for GURPS Fourth Edition. Discover "The Department of Unconventional Philosophical Resolutions" – an organization that investigates and resolves steampunk situations that get too unusual – from Pyramid #3/121: Travels and Tribulations. This book was also released as a Limited Edition Hardcover. GURPS Screampunk – Take steampunk, mix in the gruesome nightmares of horror roleplaying, and voilà . . . screampunk! 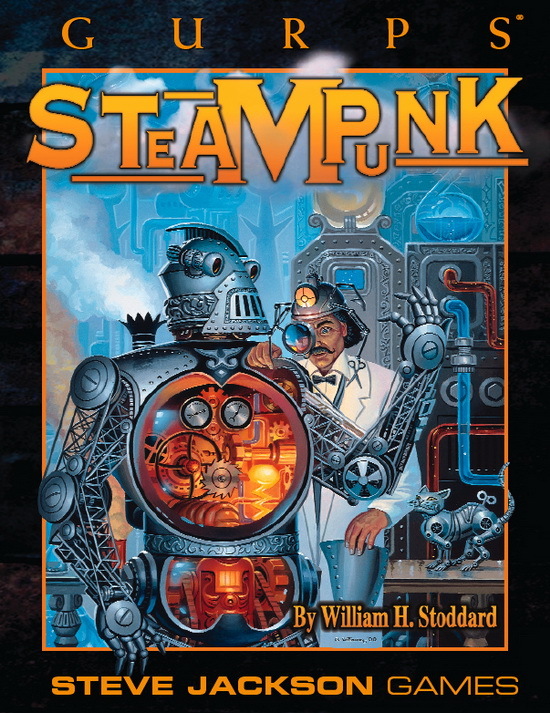 GURPS Steam-Tech – From weapons and armor to analytical engines, automata, vehicles, pharmaceuticals, and even living plant and animal creations! GURPS Steampunk Miniatures – Eight 28mm-scale miniatures for your GURPS Steampunk game!